Businesses operating within the boundaries of the RDN must be in compliance with zoning. The RDN does not issue business licenses, nor is a business license required to operate a business within its boundaries. However, home based businesses are strongly encouraged to register with the RDN, and in some cases Provincial Agencies require support from the RDN in order to issue a license or approval. 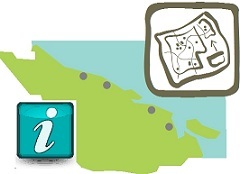 Please note: Operating a business within an incorporated area, such as the City of Nanaimo, City of Parksville, or Town of Qualicum Beach, requires a business license. Please contact these local governments directly for more information. Where required, licenses and/or approvals from Provincial agencies are necessary to operate a business within the RDN, such as for liquor and cannabis retail sales, child care, or food service. In some cases, the Provincial agency requires the RDN to support an application for a license before it can be issued. Applicants for Provincial licenses such as liquor or cannabis retail, are required to make an application to the RDN for review. Please be advised that the required licenses and approvals may need to be submitted in support of a building permit application, such as to establish a catering service or child care facility as a home based business within a residential building. Prior to establishing a new commercial business within the RDN, it is recommended to confirm with planning staff that the proposed location has suitable zoning. Please contact Current Planning to request this information in writing, if required. There is a fee of $40.00. Home based business regulations are embedded within the RDN’s two zoning bylaws, Bylaw 500 and Bylaw 1285. These regulations establish the scope and scale of commercial uses permitted within residential and rural zones. This includes regulations around signage, parking, floor area, and runoff control standards.